Wrap up a Riverbed and give it as a gift! What a special and very different present to give – the wonder of a RiverBed experience. Here’s our wonderfully simple answer to the gift of your dreams. And their dreams, too! Amazing overnight experience in a wonderful luxury lodge with hot tub. All set on a private veranda overlooking a river! Not Valid on School Holiday dates. RiverBeds 2 Night !!SPECIAL!! 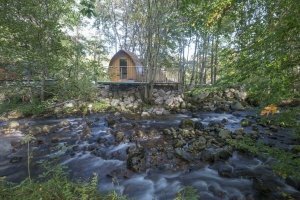 Escape to the riverbank and discover the magic of RiverBeds - amazing wee luxury lodges, in a very special setting. Welcome to the river bank and to the romantic RiverBed Experience! Purchase a gift voucher for "the most romantic overnight location in the UK"
from £50 upwards, in steps of £10. You can buy the vouchers online. There’s the opportunity to enter a personal message, and then hey presto! a pdf to print/email on as a gift will be instantly sent to you. OR you can opt for a special gift presentation, which we post out! How much to buy a “You Choose” voucher for? The cost of a RiverBed changes all the time, depending on demand and period of the week. The voucher value is redeemed against the relevant rate for the dates selected (and it is valid against special offers, too). As an indication, a voucher for £295 will unlock a RiverBed with hot tub on most mid week nights (Sunday to Thursday), and one for £395 most Friday/Saturday nights. If your recipient has any challenges in booking a date at these rates, they should call us and we will do our best to accommodate them. "Beautiful location & perfect accommodation"